Batrachium gilibertii V.I.Krecz. in Kom. Batrachium mongolicum (Krylov) Krecz. in Kom. Ranunculus acutilobus Merino, nom. illeg. Ranunculus aquatilis subsp. 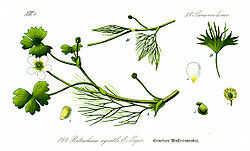 diversifolius Ehrh. Ranunculus aquatilis subvar. fluitans Gren. & Godr. Ranunculus aquatilis subvar. submersus Gren. & Godr. Ranunculus aquatilis subvar. terrestris Gren. & Godr. Ranunculus aquatilis var. heterophyllus DC. Ranunculus aquatilis var. peltatus N.H.F.Desp. nom. illeg. Ranunculus aquatilis var. radiatus N.H.F.Desp. Ranunculus carinatus (Schur) Freyn in A.Kern. Ranunculus divaricatus subsp. circinatoides (Arv.-Touv.) P.Fourn. Ranunculus diversifolius Schrank, nom. inval. Ranunculus peltatus Moench, nom. illeg. Ranunculus trichophyllus subsp. godronii (Gren.) P.Fourn. Linnaeus, C. 1753. Species Plantarum, Tomus I: 556. USDA, ARS, Germplasm Resources Information Network. Ranunculus aquatilis in the Germplasm Resources Information Network (GRIN), U.S. Department of Agriculture Agricultural Research Service. For more multimedia, look at Ranunculus aquatilis on Wikimedia Commons.